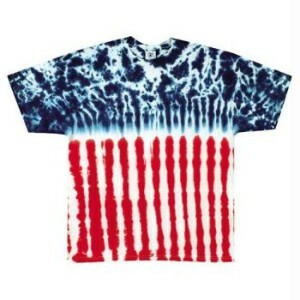 "I pledge allegiance to my tie dye..."
Our version of a U.S. flag tie dye t-shirt. High quality heavy weight cotton T-shirt that is 100% Pre Shrunk/Washed Cotton with colored fiber reactive dyes that stay bright and vivid for years. I love the design on this one but the colors weren't as bold or vivid as in the picture. If I'd seen it on the lot, I would've purchased unhesitatingly.